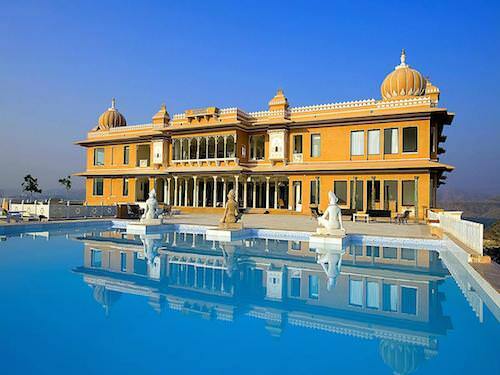 Hotel Fateh Garh Udaipur is a 50-room Rajasthan Heritage Hotel perched on a hilltop, a few kilometres away from the heart of the enchanting lake city of Udaipur. Fateh Garh incorporates local stone and antique architectural elements culled from abandoned historic buildings. A confection of bulbous domes, sugar-white pillars, crenellations, and intricate jali screens, it escapes the kitsch through its graceful proportions and airy reception areas, courtyard, and verandas—all of which are graced with antiques and delicate frescoes inspired by the style of Rajput miniatures. The hotel’s name is derived from the Urdu word for victory ‘Fateh’, and ‘Garh’ or fortress in Sanskrit, and is based on vaastu principles which is vedic architectural style for balance and harmony of natures forces. 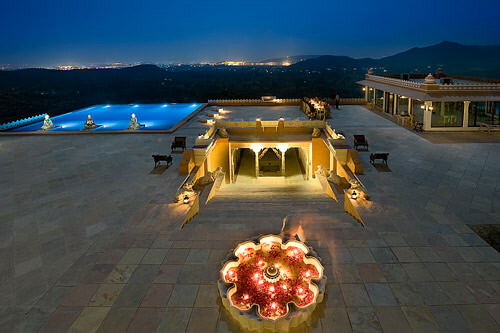 Lie by the infinity pool, listening to the sound of splashing fountains mingling with live classical shehnai music. The hotel kitchen does best with local Mewari dishes, which are a welcome change from standard Indian hotel fare. Having drinks and dinner outdoors next to the restaurant is one of the great pleasures of staying at this hotel. Udaipur is our favorite city of Rajasthan combining the views of mountains and lakes with the grand architecture of the city palace, lake palace, the temples and the parks. Fateh Garh is close enough to the heart of the city for easy access by car, yet far enough to reflect and enjoy the clean air and tranquility. During your stay at Fateh Garh, visit the Monsoon Palace perched atop a neighbouring hill for stunning views of the countryside, the mountain range and the ruined fortresses that dot the landscape.